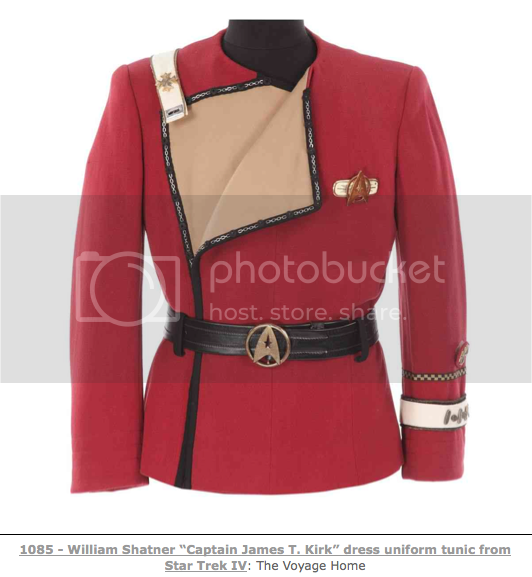 So if there was one lesson from this past Profiles in History auction, it is that there are Star Trek prop and costume collectors like you and me. And then there are rich people who like collecting Star Trek props & costumes. The latter group doesn't care about price quite so much. How else could you explain some of the prices for items that would regularly sell for a fraction of that price? It is good to be rich! Also, note that Profiles Buyer's Premium, long the lowest in the industry, is now 23%. The first two items were letters from Gene Roddenberry. The first letter only mentions Star Trek in one paragraph of a four page letter. Pretty basic in my book and not worth the $ 9,000 ($11,070 with BP) someone paid. Definitely more money than sense here. The second is a letter where Gene Rodenberry is basically whining about doing what an executive producer is expected to do, create something new! Seriously, I read this letter and was like "WTF!" But Gene had a reputation as always over-reaching on compensation (ever heard the story about the lyrics for the theme song he wrote solely to get a cut of residuals on the music?). This letter went for $ 17,000 ($ 20,910 after BP). HOLY CRAP! Enjoy your paper, but that seems insane to me. 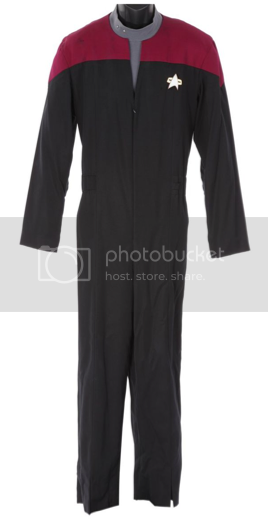 The Science Officer Tunic without insignia or rank and faded from years in storage went for a surprising $ 7,500 ($ 9,225 with BP). Seems a lot for a tunic that isn't very eye catching. 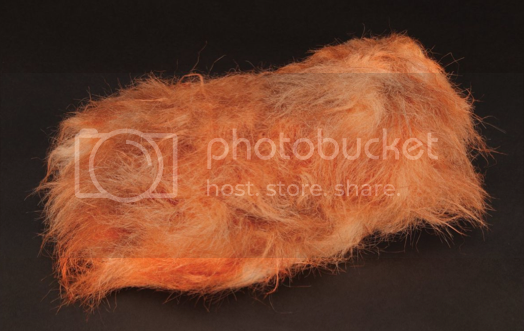 The Walking Tribble went for a crazy $ 14,000! ($ 17,220 with BP) The standard Tribble went for $ 5,500 ($ 6,765 with BP). Now, considering I just got a TOS Tribble dirct from David Gerrodl for $ 1,200, this is a bit high! The walking one is cool, but still, way high. The section of the V'Ger ship that was insanely over-priced with a $ 6,000 opening bid failed to sell. No wonder. That was pretty weak and a $ 1,000 item in my book max. It was totally unrecognizable. Of course the big news was the Mid-Grade Phaser 1 that went for $ 65,000 ($ 79,950 with BP). A record for such a piece and shows that the high end Star Trek TOS market is very strong. The Scotty Maroon went for a reasonable $ 8,000 ($ 9,840 with BP). This was an important piece for gauging the market for prices us mortals can afford. This price was in line with other Scotty Maroon's and shows that the Maroon market is still stable in the $ 5,000 (background) to $ 10,000 (Secondary character) range. The Four TOS Tunics were interesting. I am not a fan of TOS costume without pants. They just don't look right. A TOS costume without pants works, but a TOS does not. But that is my opinion and your results may vary. Now, two of them did not sell, because of high opening bids. The Picard and Riker sold at reasonable levels. With pants, add $ 1,000 or so. But the opening bids on the Geordi and Data were too high. The Voyager Collection of Uniforms passed and that was just a bad move putting them all together. Sell them individual and they get more than the opening bid. Finally the Articulated Whale Puppet sold for the opening bid of $ 5,000 ($ 6,150 with BP). Not my cup of tea, but not outrageously priced. Overall, the auction for TOS items was high and for everything later was pretty inline with previous sales. I wish all my Star Trek collecting friends a very Merry Christmas and a Happy New Year! Premier Props has an auction this weekend and there are 13 Star Trek items in it. You can find the auction on iCollector here. The first 5 items, Lots 570-574 are pretty medicore background costumes. Not worth any discussion. The next 3 items, Lots 575-577 are signed scripts. Two from Voyager and one from Deep Space Nine. Lot # 578 is allegedly a bottle from TOS. However, it appears to be a fake. 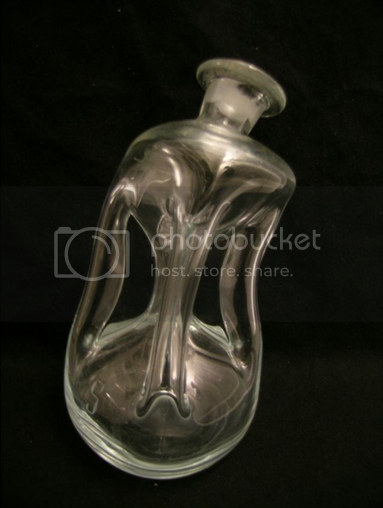 The bottle is called a Kluk Kluk and there are two types of this bottle, a clear one and a smoked one. One of the top authorities on TOS set decoration says the one in the show was a smoked one, and this one is clear. He looked at the photo and said it wasn't a match, a judgment shared by others. So how does Premier Props justify saying this is from TOS? There is no provenance, and no screen capping. Are they just taking the consignor's word? Lot # 579 is Screen Used Makeup from Star Trek: The Next Generation. At first glance this looks like a full head mask from Star Trek VI. But it says in the description that it is makeup and hair mounted on a bust for display. I think if you are interested in this item you need to call up Premier Props and get some more details. Lot # 581 is an Odo makeup appliance which I think is pretty cool. If you are a DS9 fan I would think this a good piece. Probably a $ 500-800 item. It is well displayed and comes with an autographed photo. So while there is not a lot here, there are a few good items. Just make sure you get all the information you need before biding! 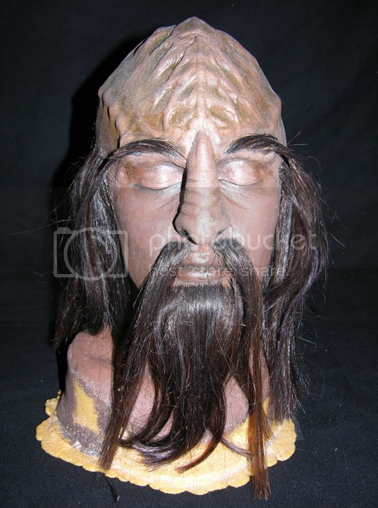 Profiles in History has 17 Star Trek items up for auction Friday, December 16th. 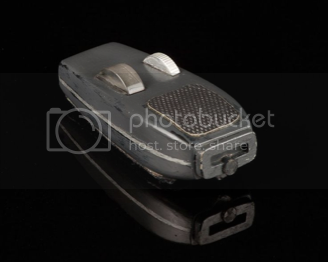 The Star Trek items are listed here. By now you all know that Profiles had to pull the two alledged "Kirk" Maroons because they weren't what Profiles claimed. So why does this happen? Because they are selling so much stuff that they just take the word of the person consigning an item and list it. They don't verify the provenance or screencap items. And I think if you are going to sell something, you need to know it is real and what you claim it is. On to the other 17 items. Overall, a nice collection. A few items jump out at you. And there are a few bad deals. Wow! A great item that OPENS at $ 30,000. OK, I don't think that is unreasonable and this easily hits $ 50,000. But remember 3 years ago the Klingon Disruptor only went for $ 35,000. The market is moving up. I think this is a great item with good provenance. Western Costume tags and the very large size of this maroon make it look legit. A good find for a collector. Opening bid at $ 6,000 puts this at $ 7,200 to start. I think this is a $ 10,000 costume max. But that is just me! Maroons aren't slowing down. Everyone wants one and for good reason. If you are a Scotty collector, then this is a good investment. I just don't like how big it is. These uniforms look best when they are slim and structured. Frankly, this should be broken up into separate lots if you really wanted to get the most money. I think the Christie's auction proved that where all the "collections" were great deals, whereas costumes got their best prices when sold seperately. $ 21,000 total So that means the high bid should be no more than roughly $ 18,000. 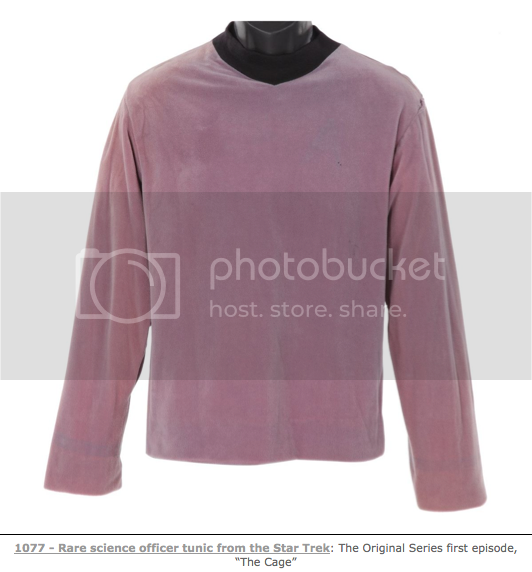 The actual title: " Rare science officer tunic from the Star Trek: The Original Series first episode, “The Cage”. But there is nothing to prove this claim. Are the stitch marks for the insignia of the smaller "Cage" style insignia? I would like more details before I attributed this to The Cage. And the whole thing about Spock wearing it is total crap. Ultimately the faded color and the lack of insignia and braid are what make this less than a great example of a TOS tunic. Still, it is original. So a good starter tunic I would think. But not at much more than $ 3,000. 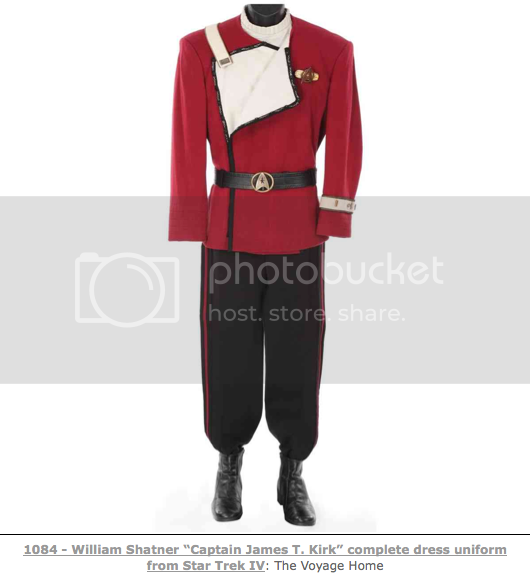 Profiles has pulled both of the Kirk costumes from their auction. The two items, listed on iCollector here, are no longer listed. One collector reported that he got an email from Profiles that the items were pulled. It became apparent to just about everyone, that the "Admiral" Kirk was not accurate. Clearly not from Star Trek IV as advertised, there were a number of problems with the Maroon, not the least of which was that it didn't match the screen used ones, and it had the wrong interior flap color. I was waiting on photos of the tags on the below "Captain" Kirk to see if it was real. It may well have been from the same consignor, casting doubts on its accuracy as well. While I have no doubts that these were production made costumes, the question is are they in fact Shatners. With them being pulled we may not know until they resurface.